Smart Solar 34252RM1 Mahayana 2-Tier Solar on Demand Fountain With Patented Underwater Integral Solar Panel and Pump System | Fountain City Art Ctr. 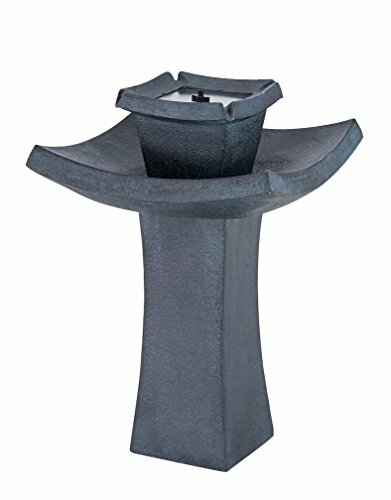 The Mahayana Two-Tier Solar Fountain has been designed for outdoor use. The pump drives water up through the fountain head and then sprinkles down into the resin bowl so that the water is constantly re-cycled. Operate daily and use the battery technology to provide consistent performances even with cloudy weather, or turn off to charge battery during the day for night time use. The battery will fully charge in one sunny day and will then have capacity for up to 6 hours of operation. Established in 2002, Smart Solar offers a wide selection of exclusively solar powered products. We design, manufacture, and customize all of our own items for your patio and garden. Enjoy our solar powered, energy efficient, and environment-friendly lighting solutions, water features, and outdoor decor. We are confident you will love solar living - that's why we've been creating solar products and growing the solar lifestyle for nearly 15 years.